Overall, Sturmgeschütz series assault guns proved very successful and served on all fronts as assault guns and tank destroyers. Although Tigers and Panthers have earned a greater notoriety, assault guns collectively destroyed more tanks. Because of their low silhouette, StuG IIIs were easy to camouflage and a difficult target. Sturmgeschütz crews were considered to be the elite of the artillery units. Sturmgeschütz units held a very impressive record of tank kills – some 20,000 enemy tanks by the spring of 1944.As of April 10, 1945, there were 1,053 StuG IIIs and 277 StuH 42s in service. Approximately 9,500 StuG IIIs of various types were produced until March 1945 by Alkett and a small number by MIAG. In terms of the resources expended in their construction, the StuG assault guns were extremely cost-effective compared to the heavier German tanks, though in the anti-tank role, it was best used defensively, as the lack of a turret would be a severe disadvantage out in the open. As the German military situation deteriorated later in the war, more and more StuG guns were constructed in comparison to tanks, in an effort to replace losses and bolster defences against the encroaching Allied forces. StuG IIIs were also exported to other nations like Bulgaria, Hungary, Italy, Romania, and Spain. After the Second World War, the Soviet Union donated some of their captured German vehicles to Syria, which continued to use them at least until the Six Days War (1967). Today, examples have been kept in running condition, including one seen in the movie Mr. Bean's Holiday. StuG III Ausf. G (Sd.Kfz. 142/1; Dec 1942– Apr 1945, 7,720 produced, 173 converted from Pz.Kpfw. III chassis): The final, and by far the most common, of the StuG series. The Ausf. G used the hull of the Pz.Kpfw. III Ausf. M. Upper superstructure was widened: welded boxes on either sides were abandoned. This new superstructure design increased its height to 2160mm. From May 1943, side hull skirts (schurzen) were fitted to G models for added armor protection particularly against anti-tank rifles. Side skirts were retro-fitted to some Ausf. F/8 models. Side skirts were also to be fitted to all front line StuGs and tanks by June 1943 in preparation for the battle of Kursk. Mountings for side skirts proved inadequate, many were lost. From March 44, improved mounting was introduced, as a result side skirts are more often seen with late model Ausf G. From May 1943, 80mm thick plates were used for frontal armor instead of two plates of 50mm+30mm. However, backlog of completed 50mm armors exited. For those, 30mm additional armors still had to be welded or bolted on, until Oct 1943. 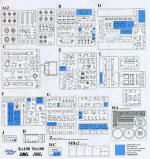 This is another of Cyber-hobby's fine Smart Kit productions. These kits provide you with photo-etch (and in this case that includes very nicely done steel side skirts) and individual track links in the box. This means no need for expensive aftermarket items, though there are those who are rarely satisfied with what comes in the kit and will want the super detail sets. Here is some background on this special boxing. “Die Erzählungdes Schwarzen Ritters” is a widely acclaimed comic book series, and it is considered to be the best work from the renowned comic artist, Motofumi Kobayashi. At the beginning the story is set on the Eastern Front in the fall of 1943. It portrays the main character, Oberleutnant Ernst von Bauer, and his Wehrmacht unit known as the 8th Tank Company, a formation that is also called “Black Knight”. Later, in the fall of 1944, Oblt. Ernst von Bauer entered the army headquarters. Subsequently he was ordered by his father, General Bauer, to return to the army HQ’s tank regiment. At that time, 3rd Platoon “Gelbe” was organized with five StuG.III Ausf.G tank destroyers and it performed well as the neo “Black Knight”. I should also mention that the kit comes with two figures. One is a half figure for posing in the commander's hatch while the other is a full standing figure. 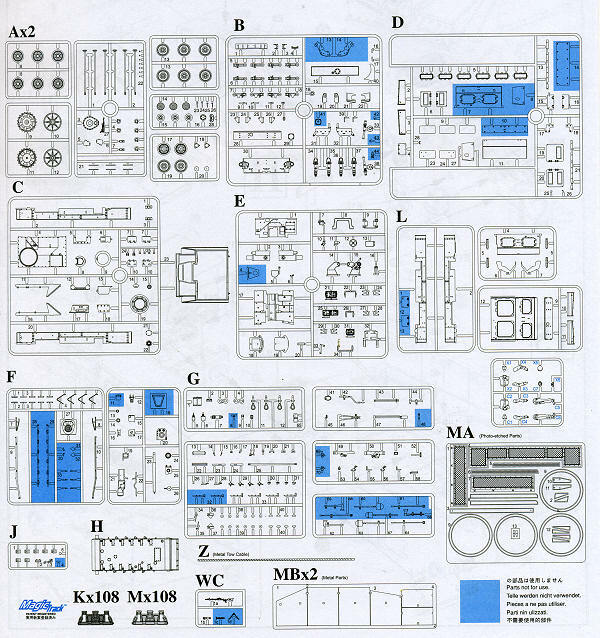 Instructions are typical of Cyber-hobby in that they are well drawn, provide detail information for some of the more difficult assemblies and clearly show any options. The color references are by Gunze paints. 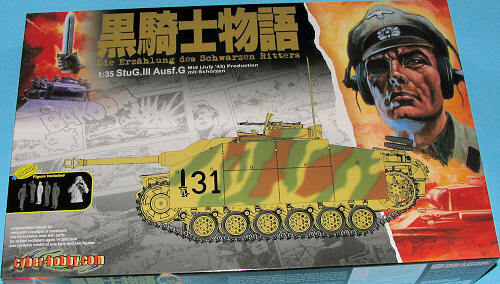 There is the box art tank as a markings option with one of five different tank numbers. Interesting to see Cyber-hobby doing what amounts to a fantasy vehicle in terms of the markings. It makes for good use of an extant kit with some upgrades and should appeal to those modelers who want to do something a tad different from the norm.